I've always been a huge fan of the "Little House" books by Laura Ingalls Wilder. My mom read them to us everyday while we ate lunch. I remember wishing that we could eat roasted pig tail, have a pig bladder for a balloon and that my dad would find an old wooden stump to turn into a smoke house. I was also impressed that Laura's only plaything was a corn cob wrapped in a piece of flannel (I continue to be impressed with that whenever I look out at the vast array of toys and trinkets spread throughout our house). Laura and her family were the epitome of DIY before DIY was cool! Anyways, I've been trying to muster up some of that pioneer spirit lately. First off, I bought a bread machine the local Goodwill. Now, I know that a true pioneer would make her own bread from scratch, but trust me, I am the worst bread-maker in the world. I couldn't even call myself a bread-maker as much as a rock-baker. So it's been a treat for us to have home-made bread on a regular basis. Chris has requested sour dough bread next. Does anyone have a good recipe for sour dough starter? 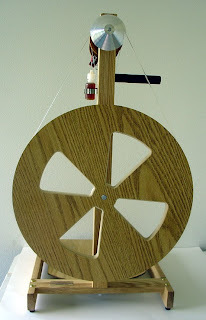 And I've been spinning it with my new spinning wheel! The other evening I had some wool simmering in the crock-pot, some bread baking in the machine, and my spinning wheel humming along and I felt a little like a modern pioneer in the 'burbs. ps I've been doing some sewing, too! 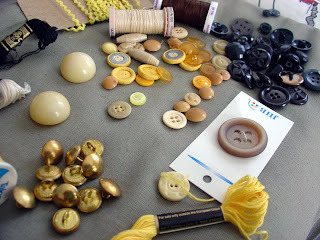 In addition to sewing for my shop, I've been working on a submission for One Yard Wonders! Wow, girl! You've been super busy!! 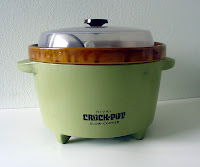 I love that avocado green crock pot - that is very cool. 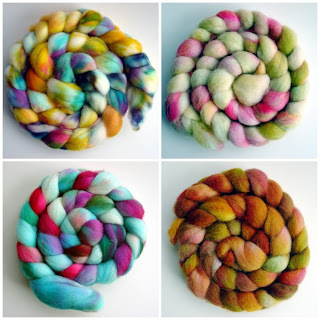 And the wool you dyed is beautiful. Really pretty colors.